Of the 30.3 million Americans (all ages) with diabetes, 23.1 million are diagnosed while 7.2 million are not officially diagnosed (source: NHANES data obtained 2011-2014). 30.3 million people represents 9.4% of the total US population. But an additional 84.1 million adults have pre-diabetes! These are people with an elevated blood glucose between 100-125 mg/dL. Most will go on to develop full-blown diabetes. As I've been saying, diabetes is going to get a lot worse before it gets better. • Diabetes in adults (ages 18 and above): If you add up adults who currently have diabetes (22.8 million) and adults with pre-diabetes (84.1 million), there are 107 million adults at risk. That's more than 40% of all adults in the US! • Diabetes in children and adolescents: Because of its association with obesity and a sedentary lifestyle, type 2 diabetes used to be a disease that was only found in adults. It is now being seen in children and adolescents. • Diabetes in Native Americans: Most often, the cause of type-2 diabetes is lifestyle (ie., a combination of sedentary lifestyle and overeating, leading to obesity). However, genetic factors also play a role. At least 10 genes involved in the development of diabetes mellitus have been identified in humans. A prime example is the high prevalence of diabetes in Native Americans, particularly Pima Indians. The rate of diabetes in American Indians is the highest of any ethnic group in the US. In the fall of 2011, world population reached 7 billion. So, stated another way, about 5.2% of the entire world population has diabetes mellitus. It is estimated that, in 2011, one person died from diabetes every 7 seconds. Type-2 makes up 90-95% of all cases of diabetes. ...the odds that a person who is a normal weight at age 18 yrs. will develop diabetes in later life are roughly 1-in-5, or 1-in-6. This is bad enough. But, "if you are very obese at age 18, the risk of developing diabetes rises to 3-in-4," he said. As summarized above, obesity is a major risk factor for type-2 diabetes. Preventing weight gain is a lot easier than dieting to lose excess weight. Americans obtain one-third of their calories outside the home. And, as we all know, restaurant portions are huge. Research shows that the more often people eat at restaurants, the more likely they are to gain weight. 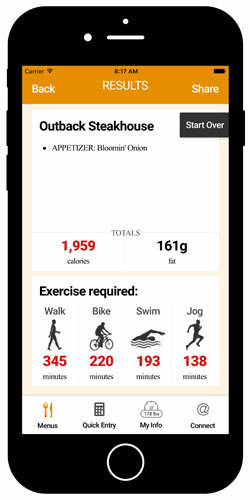 To help you make smarter choices when dining out, use our novel and award-winning Exercise Calorie Converter mobile app. Not only can you look up the calorie values of over 6000 menu items from more than 50 franchise restaurants, you can quickly convert those calories into minutes of exercise. Thinking of calories in this manner really emphasizes the importance of preventing weight gain! People with diabetes know how important diet is to maintain good blood sugar control. But, fewer are clear on how beneficial exercise can be. This is not surprising. Healthcare professionals often recommend "diet and exercise" for patients with diabetes. But, while the details regarding diet are clearly spelled out for diabetics, specific information regarding exercise is not. How much exercise? How often? And what type? In 1972, Paula Harper, a registered nurse, was diagnosed with type-1 diabetes. She discovered that the medical profession offered very little help when she asked these questions. In fact, she says, "I was most often told not to do it or given inadequate or misleading advice." She subsequently developed her own training regimen and, within a year, entered her first marathon. She has since run dozens of marathons, and competed in other endurance races, such as triathlons, ultramarathons, and century bike races (Thurm U, et al. 1992). Sadly, for a long time, the medical profession continued to discourage diabetic athletes from competition. In 1999, American swimmer Gary Hall Jr. was diagnosed with diabetes. His doctor told him he wouldn't swim competitively. Fortunately, Hall didn't listen: At the 2004 Olympic Games in Athens, Hall won the men's 50-meter freestyle, earning him the title "World's Fastest Swimmer!" In fact, for many people with type-2 diabetes, regular exercise can be highly effective. In 2003, Governor Huckabee weighed 280 lbs. His BMI was 39, one unit shy of being categorized as "morbidly obese." At his height (5'11"), his weight should be no greater than 175 lbs (based on desirable BMI values). Then, one day in March 2003, Huckabee developed numbness and tingling in his arm. His physician diagnosed diabetes. The call to action for Mike Huckabee came in June 2003 when former Arkansas governor Frank White died of a heart attack. Over the next year, Huckabee changed his diet and began running. First, he reduced his intake from 3000 down to 800 calories per day by eating meal replacement shakes and unlimited vegetables. After 3 months, his physician relaxed the diet to 1600 calories per day. After he lost 40 lbs., exercise was added. Though tough at first, after 4 months, Huckabee could run 3-4 miles. By March 2004, he had lost 105 lbs. and all symptoms of diabetes had been reversed. Huckabee was profiled in Runner's World magazine. He ran his first 5-K race on July 4, 2004 and finished in 28:39 minutes. As of November 2006, he had run 3 marathons and was planning to run in the NYC Marathon. At the Little Rock Marathon in March 2006, his finish time was 4:26. To better understand the effects of exercise on glucose control, we need to separate this process into two parts: (a) the acute effects of exercise (ie., what happens during an exercise session and for several hours afterwards) and (b) the chronic effects of exercise (ie., what happens when you exercise regularly week after week). The following information is from the excellent text: Action Plan For Diabetes, by Darryl E. Barnes, MD. During exercise, muscles use glycogen (the storage form of glucose in muscle) for energy. When glycogen is depleted, the muscle restores this loss by taking glucose out of the blood. Insulin plays a key role in controlling glucose transport into cells. Exercise stimulates cells to become more sensitive to insulin. This allows glucose to be transported into the cells at a faster rate and, in turn, reduces the blood glucose level. But, in type-1 diabetes, there isn't enough insulin. Both of these processes help to lower the blood glucose level. The process is the same for diabetics and non-diabetics. In fact, the effects of exercise can be so effective that in some non-diabetics, aerobic exercise can even reduce blood glucose levels below the normal range (70-100 mg%) (Felig P, et al. 1982). The chronic effects of exercise are related to the increase in metabolically active muscle. Regular exercise over time produces more active muscles, which in turn use more glucose, keeping the blood level in control. Improvements in glucose metabolism can be seen within one week of starting aerobic activities. However, if you stop exercising, these effects can be reversed in as few as two days. • Improvements in glycosylated hemoglobin: Glycosylated hemoglobin, or hemoglobin A1c (HgA1c), shows the impact of glucose levels over the previous three-month period. People with type-1 diabetes experience positive effects from exercise similar to those experienced by people with type-2 diabetes. However, in those with type-1 diabetes, the changes in HgA1c are entirely dependent on insulin doses and diet. • Improved circulation: Microscopically, a muscle that has been exercised regularly has an increase in the number of very small vessels (called capillaries) compared to a muscle that has not been exercised. An increase in capillary density allows more blood flow to active muscle which, in turn, increases the efficiency of glucose metabolism. • Weight loss: Weight loss is a common result of exercise in a person with type-2 diabetes. Typically weight loss will improve the overall health of someone with type-2 diabetes and will decrease the need for insulin in those who are dependent on it. However, a review of 14 studies on the effects of exercise in diabetics showed that exercise improves glycemic control even if no weight is lost (Boule NG, et al. 2001). Thus, the effects of aerobic exercise on glucose/glycogen metabolism are very therapeutic in diabetics. So, this brings us back to the original questions: What kind of exercise is recommended for diabetics? Is aerobic exercise better than resistance exercise? And how much exercise is necessary? How often? How intense? All adults with type 2 diabetes should obtain at least 150 minutes of exercise or physical activity each week. This works out to roughly 30 minutes per day, 5 days per week. The official guidelines listed above state how long to exercise, but not how hard, or what kinds of exercise are best. In terms of mortality, a study from the CDC concluded that 2 hours of walking per week lowered the mortality rate in adults with diabetes by 39%. Mortality rates were even lower for those who walked 3-4 hours per week. The researchers calculated that one death per year could be prevented for every 61 people who walk at least 2 hrs/week (Gregg EW, et al. 2003). In a thorough review, John Ivy, PhD at the University of Texas at Austin concluded that resistance exercise improves insulin sensitivity to about the same extent as aerobic exercise (Ivy JL. 1997). Hemoglobin A1c was lower in diabetics who exercised regularly. It didn't make any difference whether exercise was aerobic exercise or resistance exercise (Boule NG, et al. 2001). However, for reasons discussed below, aerobic exercise is generally preferable than resistance exercise for diabetics. Weight-lifting (by anyone) can momentarily drive blood pressure up to astronomical levels. In one report, the brachial artery pressure in a weight-lifter during leg press hit 480/350 mmHg (MacDougall JP, et al. 1985). One of the complications of diabetes is a change in blood vessels. A concern in diabetics is that such high pressures may damage the tiny vessels of the retina. 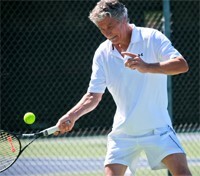 Peter A. Farrell, PhD, Department of Exercise Science at East Carolina University, writing in a Gatorade Sports Science Institute publication in 2003 states: "Until resistance exercise is proven harmless, the person with diabetes who has preexisting retinal damage should avoid this type of exercise." First, as with any person who is over 40, obtain clearance from your physician before starting a new exercise program, especially if you are out of shape. This may include a stress test. Baseline hemoglobin A1c level should be measured. The best time of day for diabetics to exercise is in the morning; disturbances in blood glucose are less likely if exercise occurs before breakfast and before the morning dose of insulin (Farrell PA. 2003). Since blood glucose levels can change rapidly, check blood glucose both before and after exercising. If blood glucose is < 5 mM (90 mg/dl), consuming some carbohydrates before exercising will likely be needed. If blood glucose is 5-15 mM (90-270 mg/dl), extra carbohydrate may not be required. If blood glucose is > 15 mM (270 mg/dl), delay exercise and measure urine ketones. If urine ketones are negative, exercise can be performed; no additional carbohydrates are necessary. If urine ketones are positive, administer insulin, and delay exercise until ketones become negative. Regarding aerobic exercise, monitor RPE (ratings of perceived exertion) instead of exercise heart rate. Diabetes affects nerve conduction. The presence of neuropathy may affect the relationship between exercise intensity and exercise heart rate. Sports like football and track and field, because activity is intermittent over a prolonged period of time, make it more difficult to balance food intake and insulin doses. Stop exercising immediately if you begin to feel nauseated or confused. An important recommendation for diabetics is to wear thick socks and properly fitting shoes when exercising. Diabetics may not sense when a blister is forming and this could predispose them to infections. If you are a diabetic with documented ophthalmic complications of diabetes, resistance exercises and any heavy-lifting activities are discouraged. So, it's clear that exercise is good for people with diabetes. The obvious next question becomes: Can the risk of developing diabetes be reduced by exercising regularly? And, the answer is, "yes" though genetics may influence this (Laaksonen DE, et al. 2007). • Research from one randomized trial showed that 150 minutes of physical activity per week, combined with weight-loss of 5-7%, reduced the rate of progression from pre-diabetes (aka: impaired glucose tolerance) to diabetes by 58% (Sigal RJ, et al. 2006). • Results from the Finnish Diabetes Prevention Study also showed a dramatic decrease in the risk of developing type-2 diabetes in adults with existing glucose intolerance. In this study, changes in lifestyle included not only more physical activity, but, also, weight loss, and dietary changes (Lindstrom J, et al. 2006). • A study from the Harvard School of Public Health, published in 1999, analyzed whether walking pace made any difference in the risk of developing diabetes. This study was conducted in over 70,000 female nurses, ages 40-65, who did not have diabetes. The researchers found that faster walking was better than moderate walking, and, moderate walking was better than slow walking (Hu FB, et al. 1999). And, there's also evidence that participation in college sports reduces the risk later in life (Frisch RE, et al. 1986). Several explanations could account for this, but it certainly argues for the long-term health benefits of sports and exercise. 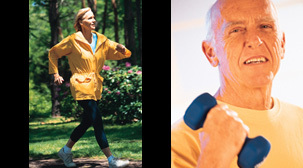 Q: You've said that regular exercise is important for the health of diabetics. But, can I still be competitive at an elite level if I have diabetes? • Distance Cycling: Cyclist Phil Southerland (USA) was diagnosed with type-1 diabetes when he was just 7 months old. Doctors told his mother that he was unlikely to live past age 25. Phil began cycling competitively at age 12. In 2007, he and his team won the 3000-mile Race Across America. He was 25 years old. He went on to combine his passion for cycling with his desire to raise awareness for diabetes by establishing "Team Type-1", a cycling group for athletes with diabetes. In 2012, Southerland and his group partnered with Novo Nordisk to create "Team Novo Nordisk," a squad of elite world athletes who have diabetes. Currently, the group includes nearly 100 cyclists, runners, and triathletes. Today (2018), Phil is 36 years old. • Distance Running: Distance runner Missy Foy (USA) was diagnosed with type-1 diabetes at age 33. She went on to become the first athlete with diabetes to qualify for the Olympic Marathon trials. She has since won over 70 races at various distances and holds many course records. • Ironman Triathlon: David Weingard (USA) was diagnosed with type-1 diabetes at age 36 while training for a survival race. A veteran of races including triathlons, he learned how to manage his diabetes during a race and eventually completed the Escape From Alcatraz Triathlon in San Francisco. He then completed several Ironman triathlons. In 2008, he founded Fit4D to improve healthcare services for diabetics. • Pro Football: Jay Cutler was the quarterback of the Chicago Bears from 2009 to 2016. He has type-1 diabetes. • Rowing: Sir Steven Redgrave (UK) won gold medals in rowing at 5 successive Olympic Games from 1984 to 2000. In 1997, at age 35, he was diagnosed with type-2 diabetes. • Sprint Swimming: Gary Hall Jr. (USA) competed in the 1996, 2000, and 2004 Olympics, winning a total of 10 medals. In 1999, he was diagnosed with type-1 diabetes. • Neuropathy: Neuropathies are a complication of diabetes. This may affect the heart rate response to exercise, thus making it more difficult to monitor exercise intensity, and, may affect sensations in the feet, increasing the risk of blisters. • Retinopathy: If there is any evidence of retinal damage, weight-lifting (because of blood pressure increases) and sports/activities such as boxing, football, hockey, karate, and judo (because of contact to the head and face) should be avoided. Q: You didn't address diet. What nutritional strategies are important? An evaluation of nearly 65,000 women over a period of more than 8 years in the Women's Health Initiative Study revealed that daily consumption of sugar-sweetened beverages substantially increased the risk of diabetes (Huang M, et al. 2017). Most brands of non-diet soda pop are sweetened with high-fructose corn syrup (HFCS). The HFCS used in solid foods (cookies, hard candies, etc.) is 42% fructose (HFCS-42), while the HFCS used in soft drinks is 55% fructose (HFCS-55). However, researchers at the U. Southern California revealed that the actual amount of fructose in most brands of soda pop averaged 59-60%, with some brands containing 65% fructose (Ventura EE, et al. 2011) (Walker RW, et al. 2014). Both table sugar (sucrose) and HFCS are unnatural forms of fructose. Thus, as best as you can, minimize your consumption of sucrose and HFCS. The fructose in raw fruits doesn't cause the same health problems as sugar and HFCS (Meyer BJ, et al. 1971) (DiNicolantonio JJ, et al. 2015). In 2015, researchers at UC Riverside found that soybean oil was a more potent inducer of obesity and diabetes than even fructose (Deol P, et al. 2015). This finding hasn't yet been widely reported. However, it should be taken very seriously. Soybean oil is the #1 oil in our food supply. As with HFCS, it's a virtual certainty that we consume soybean oil every single day! As summarized above, we are facing a global health crisis from the combination of obesity and diabetes. A sedentary lifestyle is a contributing factor in both conditions. While exercise is important for everyone, it is especially important for those who are:obese, have diabetes or pre-diabetes or have a family history of diabetes. Studies show that regular exercise is not only helpful in managing diabetes, but it may also reduce the chances of developing diabetes in these high-risk groups. So, if you have diabetes, can you exercise? Yes, you can, and, more importantly, you should! The American Association of Clinical Endocrinologists maintains the web site Empower Your Health (www.EmpowerYourHealth.org) that offers consumer information on diabetes. The CDC offers a variety of consumer resources on diabetes. Their "National Diabetes Statistics Report, 2017" is a 20-page PDF that summarizes the most current statistics on diabetes in the US. The National Diabetes Education Program (NDEP) offers a variety of educational documents on their web site at: www.NDEP.NIH.gov. For athletes with diabetes: The Diabetes Exercise and Sports Association (DESA) was founded in 1985 by Paula Harper under the name "International Diabetic Athletes Association (IDAA)", but the name was changed in 2000. In 2011, DESA merged with Insulin Independence, a non-profit organization that was founded in 2005. It appears that DESA has now been retired. 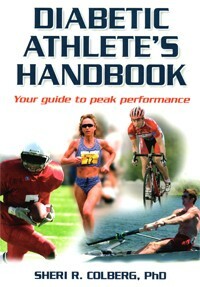 Weekend warriors and more serious athletes with diabetes may want to read: Diabetic Athlete's Handbook by Sheri Colberg, PhD. For health care professionals: Both the American College of Sports Medicine (ACSM) and the American Diabetes Association (ADA) published position statements recommending exercise for people with diabetes. An excellent paper on exercise and diabetes is Sigal, et al. 2006 (see "References" below). The Gatorade Sports Science Institute document, written by Peter Farrell, PhD (listed below in References) is an excellent resource for health care professionals.